A few weeks ago I ran a contest to promote the Forgotten Postcard Series. Typically, I work with my own images to create the Forgotten Postcards, however the idea was born from an image I created from a friend’s photo. Because I enjoy being inspired by other people’s travel photos, as well as my own, I decided to offer my services to one lucky winner of their very own Forgotten Postcard digital collage. I had always wanted to see the Taj Mahal so when I had a work trip to India, I took advantage to spend a couple days in Agra. It was even more breathtaking than I had imagined. It is massive and imposing, yet the overall impression is one of peace and calm with the gardens and reflecting pools. It was built by a Muslim emperor to honor his favorite wife after her death. It took over 20,000 workers 22 years to build. The detail and precision of the inlaid floral marble work is really amazing. My favorite part about this picture is the Indian ladies in their colorful saris contrasting against the pale marble of the Taj. 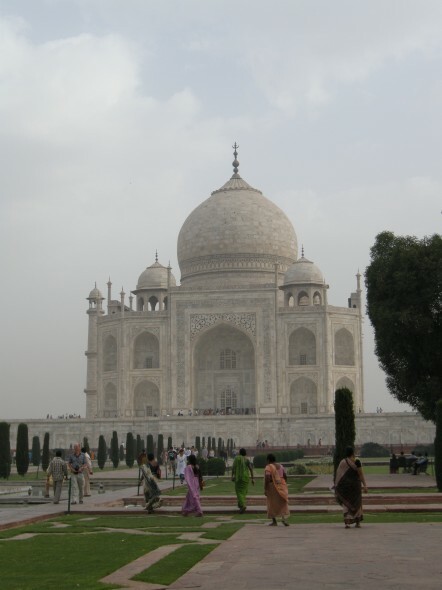 Colleen, said she got up early to see sunrise at the Taj, only to be disappointed by the grey morning. I wanted to add some vibrance back into her image and compliment the beautiful saris she was able to capture. I also wanted to remove a few of the distracting elements such as the tree on the right and the man in the striped shirt. I also had fun searching for textures and memorabilia that would work well in this collage. I was happy to find a stamp with both Gandhi and Mother Theresa as well as a Taj Mahal postmark. So what were Colleen’s thoughts on the final piece? The forgotten postcard technique worked really well to capture the history and beauty of this iconic monument (and helped hide the man, who was not wearing a colorful sari, but managed to sneak into the photo to the left of the ladies!). Thanks, Alison, for generously sharing your unique forgotten postcard technique with me and making a special trip even more memorable! You’re very welcome Colleen! Thank you for giving me the chance to share a piece of your India travels. If you have a photo you would like me to give the Forgotten Postcard treatment, email me for details and pricing. Let me take your favourite photo memory to the next level by creating a piece of timeless art for your wall. 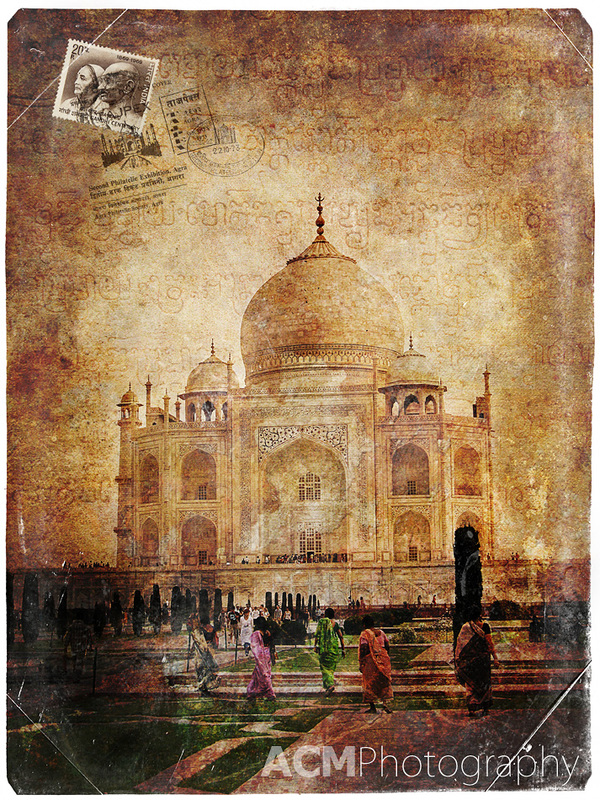 This entry was posted on Wednesday, June 16th, 2010 at 14:42 and is filed under Digital Art, Forgotten Postcards, News and tagged with agra, architecture, collage, contest, digital art, digital collage, Forgotten Postcard, india, photoshop, taj mahal, winner. You can follow any responses to this entry through the RSS 2.0 feed. Fabulous addition to the postcard series! Love the look, the aging, and that you were able to clean up the distractions! Congrats to the winner! Thank you! It was great fun to work on. Really stunning. What an amazing piece. A beautiful shot of this masterpiece of architecture. Thanks again, Alison! I just love how it turned out–how you were able to clear out some of the distractions and add the weathered look and the interesting Indian stamps. I am so excited to have this beautiful piece to help personalize my corporate apartment here. You’re very welcome Colleen and I’m so glad you’re happy with how it turned out! This image is perfect for a forgotten postcard. I love the way it turned out! I had hoped to be able to enter the contest, but got really busy preparing for our trip and never found a satisfactory photo to submit. Anyways, congrats to the winner! Thanks Amy! Sorry you didn’t have time to enter the contest. I may run one again sometime in the future but the rest of the summer is going to be BUSY! Hope you had a great trip!